Join us at Misfit Farm in Dutchess County, Hudson Valley. Learn to ride or sharpen your skills in a supportive and effective way with one-on-one attention on your horse or ours. Learn to ride or sharpen your skills in a supportive and effective way with one-on-one attention on your horse or ours. Whether you’re a brand new rider, an intermediate rider with some experience, or an expert rider continuing your education and expanding your skills, our training staff provides world-class horsemanship and riding education to students of all levels ages 7 and up. Our lessons are given in our large outdoor ring. 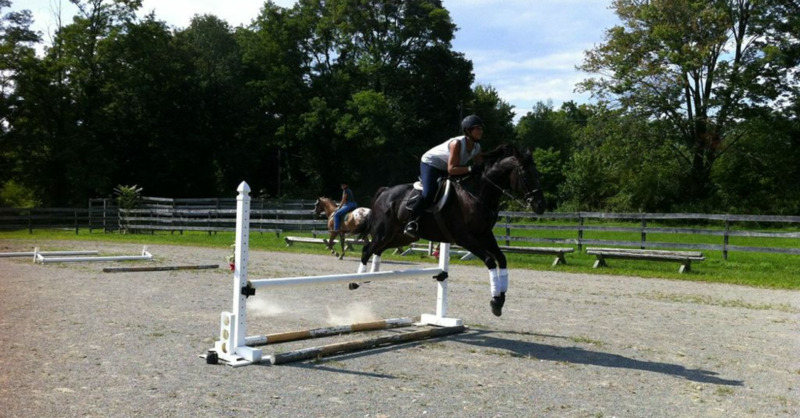 We offer English, Western, Jumping and Equitation lessons for kids 7 and up adults of all ages and skill-levels. All riders begin riding on the flat, and then may progress to jumping once fundamentals are in place and skills are solid. Your first lesson will be a half hour introductory lesson at a discounted rate, so that we can evaluate your skill-level and place you with the most appropriate mount. **Beginning riders - if you’re just starting out, we recommend that you continue to take private lessons until you’re comfortable at a walk, trot and canter and with other fundamentals. We're sorry - Semi-private lessons are not available to beginning students. One on one lesson. Just you, your horse, and your trainer. 2-3 riders at a time. Coordinated according to skill-level. Booking your first intro/evaluation lesson? CONTACT US for more info. Want to focus on your groundwork, horsemanship and stable management skills? Need a foundation in the basics of how horses work and what to do with them in all situations? Our Groundwork Lessons will give you all you need to safely and confidently work with and care for horses. Many students pair these sessions with their riding lessons, getting detailed and one-on-one instruction on anatomy, horse care, grooming, procedures and best practices, and all things horse from the ground up.